I've written about the problem with organizing screenshots in the iOS Camera Roll before, as it's one of the long-standing limitations/design decisions of iOS that I find most antiquated and counter-intuitive. Give screenshots their own album. Years ago, the consensus used to be that only geeks took screenshots of their devices, but the rising trend of people sharing screenshots of message conversations and Instagram pages now says otherwise. For this reason, I find it surprising that Apple still insists on grouping photos and screenshots together – they're separate media types and there should be an option to exclude screenshots from the main view and iCloud backups. Screenshotter is a free iPhone app developed by the Cluster team that's been released today and that shows a glimpse of a good idea that I hope Apple will offer as a built-in feature in iOS 8. After you launch Screenshotter for the first time, it'll ask for access to the Camera Roll as any other photo-enabled third-party app; once that's been granted, Screenshotter will filter out screenshots from photos in the Camera Roll and display them as large thumbnails that you can organize into albums or share. Screenshots can be archived and hidden from view, and you can long-tap any screenshot to select it and either share it or move it to a folder. It's an extremely simple system and that's exactly the basic idea that Apple should look at to focus on actual photos for its Photos app. Of course, there are limitations that make Screenshot far from the perfect utility to manage screenshots on iOS. With the exception of Apple's iPhoto, App Store apps can't delete items from the Camera Roll, which means that Screenshotter will only display images that are stored somewhere else without the possibility to delete them; for that, you'll need to jump back to the Photos app and hit the Trash button yourself. Similarly, folders you create in Screenshotter are exclusive to the app and won't be mirrored as albums in Apple's app. The developers are aware of the fact that it'd be nice to have a backup of the screenshots you organize in the app, and they're working on it for a future update. The big omission from Screenshotter is the lack of support for Open In. I'd imagine that users who are looking for a way to make sense of their screenshots also tend to send those files to other apps on iOS, and yet Screenshotter only supports the system share sheet without Open In. The (no longer developed?) Screenshot Journal used to support favorites and Open In, both of which I'd like to see in Screenshotter in a future update (alongside a simple iPad interface). 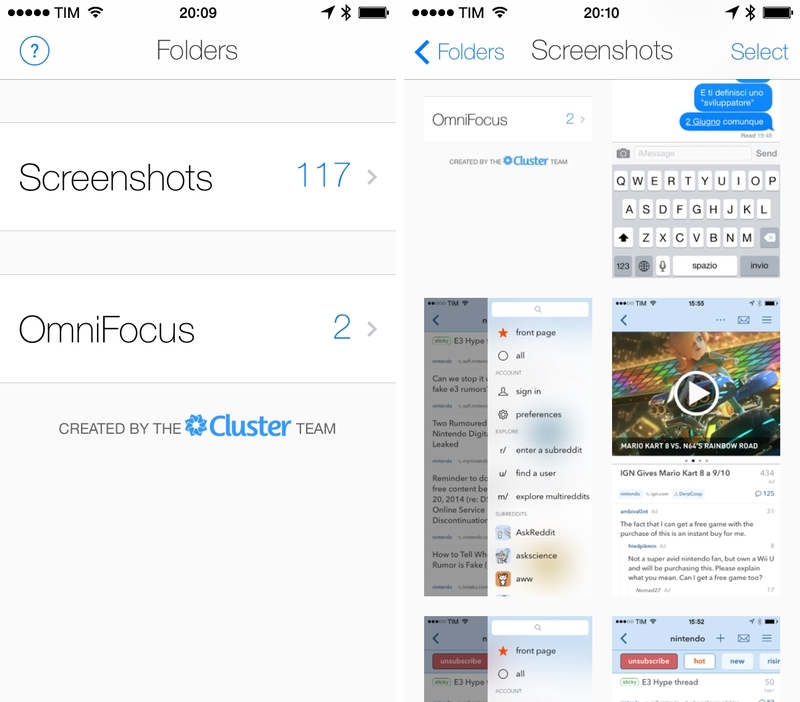 In spite of its limitations, Screenshotter provides a quick way to find and organize screenshots on your iPhone, and I hope that Apple will ship a similar feature with iOS 8. In the meantime, Screenshotter is free on the App Store with no ads or In-App Purchases.